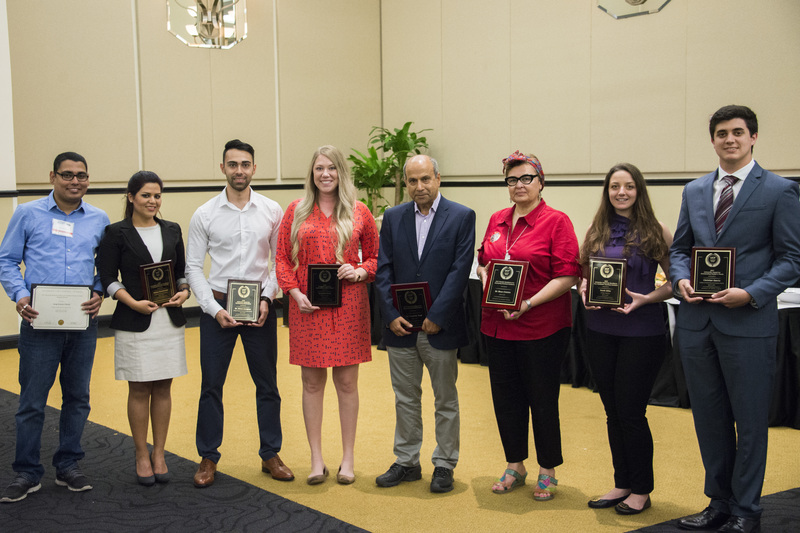 UCF sponsors several awards for graduate students and faculty recognizing excellence in research, teaching, and mentoring. Acknowledging graduate students for their accomplishments is an important part of providing a rewarding academic experience. The College of Graduate Studies offers these awards every year to recognize our outstanding graduate students in a variety of categories. We commend all graduate students who strive for excellence academically and professionally and encourage program faculty to nominate those who have excelled in a given category. It is also important to recognize faculty members who have gone above and beyond in mentoring of graduate students. The College of Graduate Studies encourages all recent alumni or current faculty to nominate those faculty members who have worked hard in the support of graduate students’ academic and professional development. Nominations must be submitted electronically to your College’s Associate Dean for Graduate Studies for consideration for the college award. The college associate dean will charge a committee to evaluate the documentation submitted by the nominees and select the person to receive the college award. The selected award winner for each college will then be forwarded to the Vice President for Research and Dean of the College of Graduate Studies for consideration for the university award. Forwarded files must contain a letter of support from the college Dean/School Director, or his/her designee. Nominations received by College Associate Dean for Graduate Studies in your college. Your college may have an earlier nomination deadline for these awards, so please check with your college. College Associate Dean for Graduate Studies submits electronic nominations (only one per college for each award) to the Vice President for Research and Dean of the College of Graduate Studies. Nominations will be forwarded to the Graduate Council to review and recommend students for the awards to the Vice President for Research and Dean of the College of Graduate Studies, who makes the final selection and notifies recipients. Each winner of the university awards will receive a certificate and a cash award of $1,500. For each university award, as many as two honorable mentions can be awarded and each will receive a certificate. The Award for the Outstanding Dissertation recognizes doctoral students for excellence in the dissertation. The focus of this award is on the quality and contribution of the student’s dissertation. Excellence of the dissertation may be demonstrated by evidence such as, but not limited to: publications in refereed journals, awards and recognition from professional organizations, and praise from faculty members and other colleagues in the field. Students can only win the university award once. An electronic one-page nomination letter from a faculty member that discusses the dissertation research of the nominee with particular attention paid to the content and quality of the dissertation. This letter should address the strength of the dissertation and its contributions to the field. An electronic copy of the student’s completed and approved dissertation. An electronic copy of the student’s complete curriculum vitae, highlighting any publication and/or recognition of the dissertation. A brief electronic (no more than one page) statement regarding the student’s experience in conducting the dissertation, his/her interpretation of the significance of the work, and how he/she benefited from the dissertation experience. Electronic copies of papers authored or co-authored by the student based on the dissertation. Applications must be submitted electronically to your Associate Dean for Graduate Studies in your academic college. The Award for the Outstanding Master’s Thesis recognizes graduate students for excellence in the master’s thesis. The focus of this award is on the quality and contribution of the student’s thesis research. Excellence of the master’s thesis may be demonstrated by evidence such as (but not limited to): publications in refereed journals, awards and recognition from professional organizations, and praise from faculty members and other colleagues in the field. An electronic one-page nomination letter from the chair of the department or a faculty member that discusses the thesis research of the nominee, with particular attention paid to the content and quality of the master’s thesis. This letter should address the strengths of the thesis and its contributions to the field. An electronic copy of the student’s completed and approved thesis. An electronic copy of the student’s complete curriculum vita, highlighting any publication and/or recognition of the thesis. A brief electronic (no more than one page) statement regarding the student’s experience in conducting the thesis, his/her interpretation of the significance of the work, and how he/she benefited from the thesis experience. Electronic copies of papers authored or co-authored by the student based on the thesis. The Award for Graduate Teaching Assistant recognizes excellence by graduate teaching assistants (GTAs) who are not instructors of record, but who provide teaching support and assistance under the direction of a lead teacher. This award focuses on the extent and quality of the assistance provided by the student to the lead instructor and the students in the class. Excellence in serving as a GTA may be demonstrated by evidences such as (but not limited to): lead teacher evaluations, student letters attesting to teaching excellence (limited to no more than five pages), a typical lab syllabus, a sample project/assignment for which the GTA was responsible for grading. An electronic one-page nomination letter from the chair of the department or a faculty member that discusses the teaching of the nominee, with particular attention paid to the nominee’s contribution to the teaching of the department. This letter should address the strengths of the student, stressing how the nominee stands out within the departmental context. An electronic copy of the student’s complete curriculum vita, highlighting the student’s teaching assignments and accomplishments. A brief electronic (no more than one page) statement of the student’s teaching philosophy. Electronic copies of syllabi for all courses for which the student served as a GTA. Electronic copies of summaries of all teaching evaluations. The Award for Graduate Student Teaching recognizes excellence in teaching by graduate teaching assistants who serve as instructors of record and have independent classroom responsibilities. The focus of this award is on the quality of the student’s teaching and the academic contributions of those activities. Excellence in teaching may be demonstrated by evidences such as (but not limited to): awards or honors received in recognition of teaching excellence, outstanding evaluations of teaching, presentations or publications related to teaching, comments and/or evaluations from students or faculty regarding the outstanding nature of the student’s teaching. An electronic copy of the student’s complete curriculum vita, highlighting the student’s teaching accomplishments and contributions to the development of academic programs, courses, and teaching materials. Electronic copies of syllabi for all courses taught. Electronic copies of noteworthy teaching-related papers authored or co-authored by the student or other appropriate documentation of the student’s teaching. The Order of Pegasus recognizes exemplary performance by University of Central Florida students. Graduate students are selected based on academic achievement, professional or community service, leadership, and publication or research experiences. The Order of Pegasus is the most prestigious and significant student award that can be attained at the university. Please visit the Order of Pegasus website for more information. The Award for Faculty Excellence in Mentoring Doctoral Students recognizes the dedication and mentoring shown by faculty members who helped guide their students through their academic and professional development. Faculty members can only be nominated for this award by individuals who graduated with their UCF doctoral degrees within 2018 (May, August, or December graduations) or by any UCF graduate faculty. How does the faculty mentor provide a supportive environment that facilitates the best performance and talents of his/her student(s) in their discipline? How does the faculty mentor prepare his/her student(s) to excel in their professional discipline? For example, how was the student prepared to establish his/her own record of scholarly activity or performance, obtain external fellowships or grants, deliver conference presentations, or engage in other professional development activities? What other qualities does the faculty member possess that contribute to his/her ability to be an outstanding mentor? Does the faculty mentor possess a record of achievement in successfully mentoring his/her students to the successful completion of their degree? Nominations must be submitted electronically to Dr. John Weishampel at john.weishampel@ucf.edu in the College of Graduate Studies for consideration for the Faculty Excellence in Mentoring Doctoral Students Award on or before 5:00 p.m. on January 29, 2019. Nominations will be reviewed by a faculty committee and recommendations for the awards will be sent to the Vice President for Research and Dean of the College of Graduate Studies, who makes the final selection and notifies recipients. The content of your nomination will be anonymous unless you give permission to quote from the statements. Upon receipt of a nomination, the College of Graduate Studies will solicit a one-page statement of personal philosophy about student mentoring from the nominated faculty member. The winner in each discipline category will receive a plaque, publicity and a cash award to be used for professional purposes. Please visit the Office of the Provost’s website for information on these awards including nomination and submission deadlines and criteria. Of the thousands of students pursuing their graduate education at UCF each year, students are selected from a group of nominees in each college as the university winners in the areas of Excellence in Graduate Student Teaching, Excellence by a Graduate Teaching Assistant, Outstanding Master’s Thesis, and Outstanding Dissertation. Each award recipient is recognized throughout the university community as having shown truly exceptional work. UCF also recognizes two faculty members for their dedication and guidance in the mentorship of doctoral students. Outstanding faculty are nominated for the award by graduate faculty or doctoral students who graduated in the past year. Gitto assisted students with laboratory work and has graded laboratory reports, practices, quizzes and homework. One of her students says that Gitto was ready and prepared to answer any questions regarding experiments or techniques. She does her best to spark interest in her students and has learned that providing real-world relevance to the laboratory techniques can help engage students. Ghosh was nominated because of his dedication to teaching and mentoring students, his ability to mentor other GTAs, his superb efficiency, and his remarkable dedication to his GTA duties. His students describe Ghosh as “extremely fair” in his assessments, “knowledgeable on the material,” and “interested in [students’] learning.” One student observed, “Professor Ghosh loves programming, and it shows. Khoshnoud is an excellent teacher and has done an outstanding job of preparing and executing her teaching assignments. Her student evaluations consistently rank high. Students regularly comment that her course is demanding, but describe Khoshnoud as knowledgeable, respectful, helpful and genuinely concerned for the success of the students. Thesis: Geolocation of diseased leaves in strawberry orchards for a custom-designed octorotor. Garcia’s thesis focused on the design and control of an octorotor to survey citrus/strawberry fields for disease detection. In this research, he was the main person to design, manufacture and flight test an innovative octorotor platform. Garcia has published two peer-reviewed conference papers and has one journal paper under review. His research is innovative, employs hands-on engineering design techniques, and contributes significantly to new software, algorithm, and theoretical development. Thesis: Cerebrovascular burden and depression: Examining a process model of geriatric developmental psychopathology. Scott’s thesis is comprised of two complementary studies: 1) the relationship between cerebrovascular risk (hypertension, diabetes, etc.) and later-life depression; and 2) the relationship of a gene and associated protein with dementia risk. In addressing these unanswered empirical questions, she managed large, complex datasets and employed advanced statistical methods for the analysis of longitudinal data. Scott has presented her work at the annual meeting of the Gerontological Society of America and has published in the International Journal of Geriatric Psychiatry and the Journal of Clinical Psychiatry, both leading journals. Dissertation: Global data association for multiple pedestrian tracking. Dr. Dehghan’s research focused on object tracking, one of the most fundamental problems in computer vision. He tackled the data association component of object tracking and contributed three novel methods for solving data association. During his PhD studies, Dr, Dehghan has significantly contributed to several high visibility research projects that involved his profound knowledge of computer vision coupled with great programming skills. He has a stellar publication record, with Google Scholar showing that his papers have received 863 citations. Many of his publications are in prestigious computer vision conferences and journals. Dissertation: Intramuscular TNF-α signaling in response to resistance exercise and recovery in untrained males. Dr. Townsend’s dissertation was the first to examine the nuclear factor kappa B signaling cascade in response to muscle-damaging exercise in healthy males. This pathway is the most studied pathway in conditions like cancer and cachexia, and it is considered to be the pathway associated with rapid skeletal muscle loss. Dr. Townsend’s study demonstrated how resistance exercise can acutely upregulate this pathway as part of the body’s recovery and regeneration process. He has authored two papers from his dissertation, one in the European Journal of Applied Physiology and the other in Physiological Reports. Dr. Shah’s students describe him as a great mentor and an excellent teacher/researcher who has established one of the most famous Computer Vision groups in the world. He mentors his students to become creative in their research and learn to think out of the box. On a regular basis, he invites top researchers to visit UCF, give talks and spend time with students. Dr. Shah helps his students develop the research, communication and networking skills to be successful leaders in their field. Dr. Cintrón’s students describe her as always there for her students. She fosters a supportive relationship among her doctoral students through regular group meetings to discuss their progress and challenges, and to help them renew their commitment to complete their dissertations and graduate. Her students count themselves fortunate to have had Dr. Cintrón as mentor, guide, teacher and inspiration. Mobarakeh is a doctoral student in the Computer Engineering PhD program. Mobarakeh was described as the most effective, responsible, innovative and caring GTA his adviser has ever had. He helps students have a better understanding of computer organization via hands-on experience. Mobarakeh’s teaching style is highly effective, and in fact, it is so innovative that a paper outlining his pedagogy has been accepted for presentation to the American Society for Engineering Education Southeast Section Conference. Gaudiello is a doctoral student in the Mathematics PhD program. Gaudiello is a dedicated teacher who creates a welcoming environment in which students feel comfortable seeking her help and advice. Her teaching style is highly effective and students perform exceptionally well in her classes. Gaudiello also relates mathematical concepts to everyday uses and tries to integrate interesting and relatable topics into her lesson plans. Church’s thesis is titled: Dishwashing Water Recycling System and Related Water Quality Standards for Military Use. His thesis focused on recommending water quality standards for dishwater recycling for military use. In remote locations with limited water supply, such as those in military instillations, it is imperative to conserve freshwater. The U.S. Army and U.S. Navy have been working on standards for greywater and they have requested his paper for future consideration. Church has published his results in several national conferences and also in the journal Science of the Total Environment. Church is continuing his studies in the Environmental Engineering PhD program at UCF and he has received the NASA Florida Space Grant Consortium doctoral fellowship for 2015-2016. Dr. Park’s dissertation is titled: Exploration and Development of Crash Modification Factors and Functions for Single and Multiple Treatments. Dr. Park’s research focused on a critical assessment of the newly developed Highway Safety Manual. He identified critical flaws in the manual and provided novel solutions to rectify numerous issues and improve the prediction of traffic accidents. His work has already been incorporated into the CMF Clearinghouse and will impact the future version of the Highway Safety Manual. Saving lives and suffering is the utmost objective for engineers, and his work will achieve that. His mentor was Mohamed Abdel-Aty, PhD. Dr. Peale’s students describe him as an outstanding mentor and great physicist. His eagerness to teach his students has been described as extraordinary. Dr. Peale’s vision and support have enabled his students to become managers and leaders in their chosen professions, whether in academia or industry. Dr. Rothschild’s students describe her as a model of research expertise. She provides guidance and assistance where needed, yet allows students the autonomy to complete their research goals. She believes that professionalism refers to upholding the core values of the physical therapy profession: altruism, excellence, caring, ethics, respect, communication and accountability. Lancaster is a master’s student in the Film program in the School of Visual Arts and Design and has been a teaching assistant for three semesters. His lectures have been superior and his energy is infectious, as it gets the students excited about the material. While working hard in his academic life, Ben is also married, raising a toddler, preparing to shoot his feature thesis film and is holding down two jobs. Pompos Mansfield is a master’s student in the Rhetoric and Composition program. She is very dedicated to helping her First-Year Composition students become more effective writers and communicators. Based on her performance as a teacher during her first year as a GTA, Melissa was awarded the Department of Writing and Rhetoric’s Graduate Teaching Assistant Teaching Excellence Award in Spring 2014. Tye’s thesis is titles, Integral Projection Models Reveal Interactive Effects of Biotic Factors and Disturbance on Plant Demography. Tye’s research interests are in population modeling, theoretical ecology and biological conservation. His work aims to inform better management and conservation. Tye’s mentor was Pedro Quintana Ascencio, PhD. Dr. Miri’s dissertation is titled, Parity-Time and Supersymmetry in Optics. Dr. Miri’s research is mainly focused on the theory and applications of parity-time (PT) symmetry in optics and has made a number of significant contributions to this field. His dissertation research has led to more than 50 publications, including 18 journal papers. 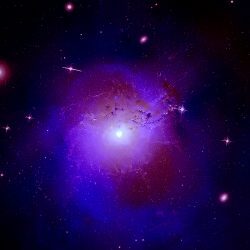 Most of them were published in the highest impact journals of optics and physics, including Science, Nature, Nature Photonics, and Nature Physics. His mentor was Demetrios N. Christodoulides, PhD. Mohamed Abdel-Aty, PhD, Department Chair and Professor of Civil, Environmental and Construction Engineering. 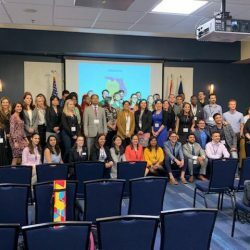 Dr. Abdel-Aty has supervised more than 50 Master’s and PhD students, served on 17 completed PhD committees at UCF as well as nine PhD committees at universities around the world. He currently supervises 10 PhD students. Rosemarye Taylor, Interim Associate Dean for Graduate Affairs in the School of Teaching, Learning and Leadership and Professor of Educational Leadership. Since 2000, Dr. Taylor has chaired more than 50 dissertation committees for doctoral students, many of whom are administrators or faculty in higher education and leaders in schools or in school organizations. Townsend plays an integral role in teaching students in the Sport and Exercise Science program where his enthusiasm has earned exceptional student ratings. By integrating his research into teaching, Townsend is able to deliver knowledge to the classroom that has not yet made it into the textbooks. His passion and commitment to infusing his class material with cutting-edge research captivates students and distinguishes him as an exceptional teacher. Kraft’s thesis, The Characterization of the Effects of Stress Concentrations on the Mechanical Behavior of Micronic Woven Wire Mesh, resulted in the development of a new anisotropic elasticity and plasticity theory for materials used in homeland security and water reclamation applications. His extraordinary thesis research has already received multiple citations from third-party authors. Kraft’s mentor was Ali P. Gordon, PhD. Dr. Zhang’s dissertation, Squaraine Dyes, Design and Synthesis for Various Functional Materials Applications, focused on the modulation of optical properties of materials through supramolecular assembly, resulting in enhancements in his field and publications and significant contributions to papers in leading journals, such as Langmuir, Biomaterials, Biomedical Optic Express and ACS Applied Materials and Interfaces. His mentor was Kevin Belfield, PhD. Kevin Belfield, PhD, Department Chair and Professor of Chemistry. Eduardo Salas, PhD, University Trustee Chair and Professor of Psychology. Dr. Salas’s outstanding reputation in the field and as a mentor draws students to the University of Central Florida. He develops the competencies needed for students to be successful scientist-practitioners in the field: how to collaborate, how to be adaptive, how to think on your feet. He recognizes students’ abilities, providing opportunities to further their strengths and improve upon their weaknesses, promotes critical thinking, and ensures that his students leave as confident professionals. Meghan is mentored by Kathie K. Holland, MBA, who notes that Meghan truly wants each student to succeed and regularly receives compliments about Meghan’s exceptional work. Meghan is known for her timely assignment grading, detailed feedback, and office hours held each workday. She was a GTA for four semesters in How to Start a Business as well as Strategic Management. Sean instructed multiple Capstone and Moral Foundations of Business courses. Sean’s mentor, Marshall J. Schminke, PhD, says Sean helps students become not just better business students, but better business people. With very high course evaluations from 4.7 to 4.8 out of 5, Sean is considered the best the College of Business has to offer. Ashley’s thesis is entitled Effects Of Allotropic Transformations On Interdiffusion Behavior In Binary Systems, and it investigates the diffusional interactions that occur between the metallic materials that make up the fuel and cladding components of a nuclear fuel plate. Ashley’s mentor was Yongho Sohn, PhD. 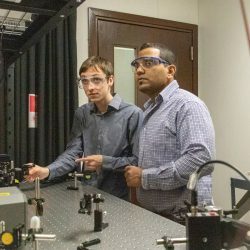 Abhishek’s dissertation is entitled Evaporation, Precipitation Dynamics And Instability Of Acoustically Levitated Functional Droplets, which used optics, laser-based experiments, and ultrasonic levitation to detail droplets that are only hundreds of microns in diameter. Abhishek’s mentor was Ranganathan Kumar, PhD. Dr. Lambie aims to model the behaviors that he wants to foster in his mentees. He believes doctoral students learn much of what it means to be a faculty member based on their observations of their mentors. Therefore, he models effective research and scholarly productivity to his students, for example, by frequently offering opportunities for the students to engage in research that leads to refereed national publications. Andrea is mentored by Dr. Steven Duranceau. She was a GTA for multiple Chemistry and Biology lab sessions. Andrea was well-known amongst her students for being organized, prepared, friendly, approachable, and extremely helpful. Kelly instructed mixed mode and online courses and consistently received class evaluations ranging from Very Good to Excellent. Dr. Lisa Dieker, Kelly’s mentor, says Kelly is one of the most passionate, bright, and forward-thinking students she has met in her career. Zhao’s thesis is entitled Nonlinear Estimation and Control for Assistive Robots, and it centers on the development of smart assistive robot arms that can aid individuals living with paralysis. Zhao’s mentor was Dr. Aman Behal. Haitham’s dissertation is entitled A Framework for Quantifying Sustainability of Lean Implementation in Healthcare Organizations. Haitham’s research was the first to address factors of lean in a balanced manner, says his mentor, Dr. Ahmad K. Elshennawy. 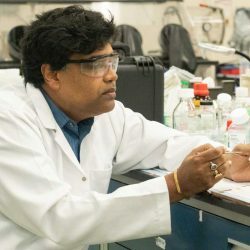 As an advisor, Dr. Sukthankar’s goal is to train students to be capable and persistent researchers who are able to tackle the challenges of the future. “I teach my students to be good problem solvers, to be self-educating, and how to work in teams. My belief is that those skills never go out of style and are critical to post-graduation employment success,” Dr. Sukthankar says. The students she advised highlighted her constant professional and personal support. Dr. Cintrón says she offers her students her brain to pick, her ear to listen, and a solid push in the right direction when needed. “My aim is to always develop students so that they will surpass me,” says Dr. Cintrón. She offers moral and personal support, encouraging her students to open up about their important, personal matters because she believes that what happens outside their classroom matters. Dr. Cintrón also holds a Dissertation Writing Group (DWG) that meets every four‐five weeks at her dinner table and simulates a classroom environment.